ADCETRIS® (brentuximab vedotin) is indicated for the treatment of adult patients with previously untreated Stage III/IV classical Hodgkin lymphoma (cHL) in combination with chemotherapy. IRF = independent review facility; ITT = intent to treat; N.A. = North America; PFS = progression-free survival. therapy for patients not in complete response after completion of frontline therapy. 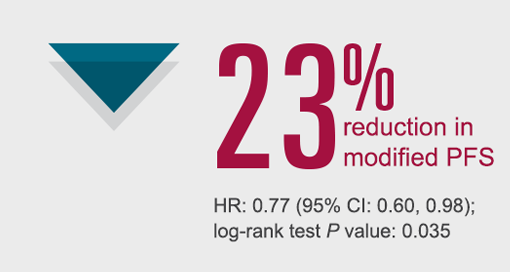 ‡The primary endpoint in ECHELON-1 is modified PFS per IRF in the ITT population. 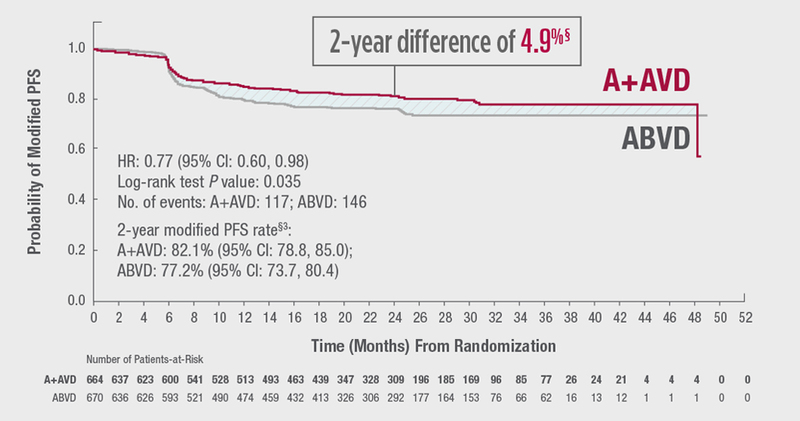 §The primary endpoint in ECHELON-1 is modified PFS per IRF; the event rate at 2 years was not pre-specified. ¶At the time of modified PFS analysis. **Median follow-up time for both treatment arms was 24.7 months. ††Modified PFS per IRF in North America was a pre-specified subgroup analysis. 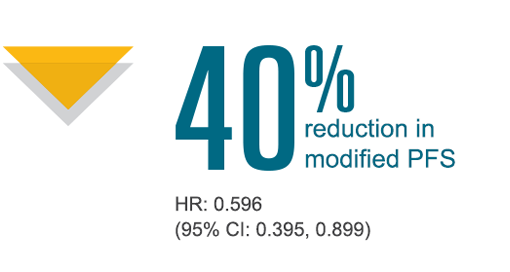 The primary endpoint in ECHELON-1 is modified PFS per IRF in the intent-to-treat population. • Hematologic toxicities: Fatal and serious cases of febrile neutropenia have been reported with ADCETRIS. Prolonged (≥1 week) severe neutropenia and Grade 3 or 4 thrombocytopenia or anemia can occur with ADCETRIS. Administer G-CSF primary prophylaxis starting with Cycle 1 for previously untreated patients who receive ADCETRIS in combination with chemotherapy for Stage III/IV cHL. • PML: Fatal cases of JC virus infection resulting in PML have been reported in ADCETRIS-treated patients. First onset of symptoms occurred at various times from initiation of ADCETRIS, with some cases occurring within 3 months of initial exposure. In addition to ADCETRIS therapy, other possible contributory factors include prior therapies and underlying disease that may cause immunosuppression. Consider PML diagnosis in patients with new-onset signs and symptoms of central nervous system abnormalities. Hold ADCETRIS if PML is suspected and discontinue ADCETRIS if PML is confirmed. • Pulmonary toxicity: Fatal and serious events of noninfectious pulmonary toxicity, including pneumonitis, interstitial lung disease, and acute respiratory distress syndrome have been reported. Monitor patients for signs and symptoms, including cough and dyspnea. In the event of new or worsening pulmonary symptoms, hold ADCETRIS dosing during evaluation and until symptomatic improvement. or TEN occurs, discontinue ADCETRIS and administer appropriate medical therapy. • Gastrointestinal (GI) complications: Fatal and serious cases of acute pancreatitis have been reported. Other fatal and serious GI complications include perforation, hemorrhage, erosion, ulcer, intestinal obstruction, enterocolitis, neutropenic colitis, and ileus. Lymphoma with preexisting GI involvement may increase the risk of perforation. In the event of new or worsening GI symptoms, including severe abdominal pain, perform a prompt diagnostic evaluation and treat appropriately. Neutropenia, anemia, peripheral sensory neuropathy, nausea, fatigue, constipation, diarrhea, vomiting, and pyrexia. Please see full Prescribing Information, including BOXED WARNING, here. Inc. March 2018. 2. Ramchandren R, Advani R, Ansell S, et al. Brentuximab vedotin (BV) plus chemotherapy in patients with newly diagnosed advanced stage Hodgkin lymphoma (HL): North American results. Poster presented at ASCO; June 1-5, 2018; Chicago, IL. 3. Connors JM, Jurczak W, Straus DJ, et al. Brentuximab vedotin with chemotherapy for stage Ill or IV Hodgkin's lymphoma. N Engl J Med. 2018;378:331-344.
are US registered trademarks of Seattle Genetics, Inc.